Speculation that Grubbs had been arrested began surfacing last year after KFC Watermelon stopped responding to customer support queries on Hackforums[dot]net, the Web site where he primarily sold his product. Grubbs, using the hacker nickname “KFC Watermelon,” advertised and sold his RAT via Hackforums.net. The sale and marketing of remote access tools, also known as remote administration tools, is not illegal in the United States, and indeed there are plenty of such tools sold by legitimate companies to help computer experts remotely administer computers. However, these tools tend to be viewed by prosecutors instead as “Remote Access Trojans” when their proprietors advertise the programs as hacking devices and provide customer support aimed at helping buyers deploy the RATs stealthily and evade detection by anti-malware programs. Linking Grubbs to LuminosityLink was likely not a tall hurdle for prosecutors. A public filing at the Kentucky Secretary of State office lists Grubbs as the owner of Luminosity Security Solutions LLC. 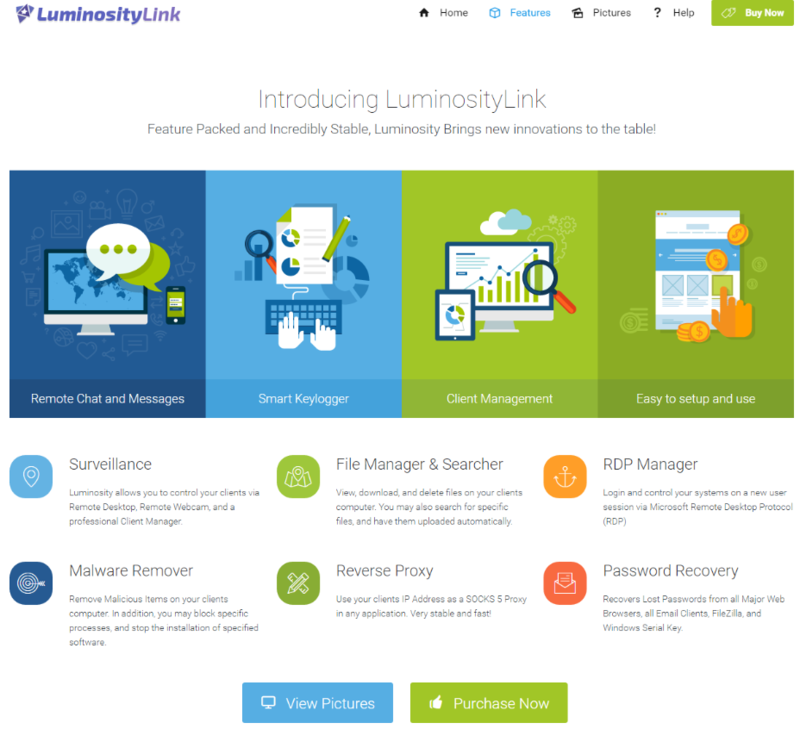 However, there are indications that Luminosity was not Grubbs’ first foray into making and selling malware tools. According to a February 2018 blog post by Palo Alto Networks, the Skype account connected to KFC Watermelon’s identity on Hackforums is tied to the email address “[email protected]; that email account was used in 2013 to register “plasmarat.pw,” a similar RAT sold and marketed on Hackforums. 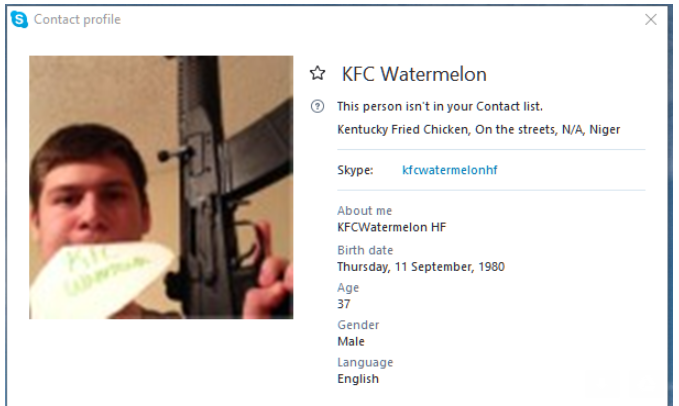 KFC Watermelon’s Skype profile (the “HF” in his Skype name is a likely reference to HackForums, where both Luminosity RAT and Plasma RAT were primarily sold and marketed). Around the time that KFC Watermelon stopped responding to support requests on Hackforums, federal prosecutors were securing a guilty plea against Taylor Huddleston, a then 27-year-old programmer from Arkansas who sold the “NanoCore RAT.” Like Grubbs, Huddleston initially pleaded not guilty to computer intrusion charges, arguing that he wasn’t responsible for how customers used his products. That is, until prosecutors presented Skype logs showing that Huddleston routinely helped buyers work out how to use the tools to secretly compromise remote computers. Grubbs’ guilty plea could well lead to further arrests and prosecutions of customers who purchased and used LuminosityLink. Case in point: The author of the Blackshades Trojan — once a wildly popular RAT sold principally on Hackforums — was arrested along along with dozens of his customers in a global law enforcement sweep in 2014. 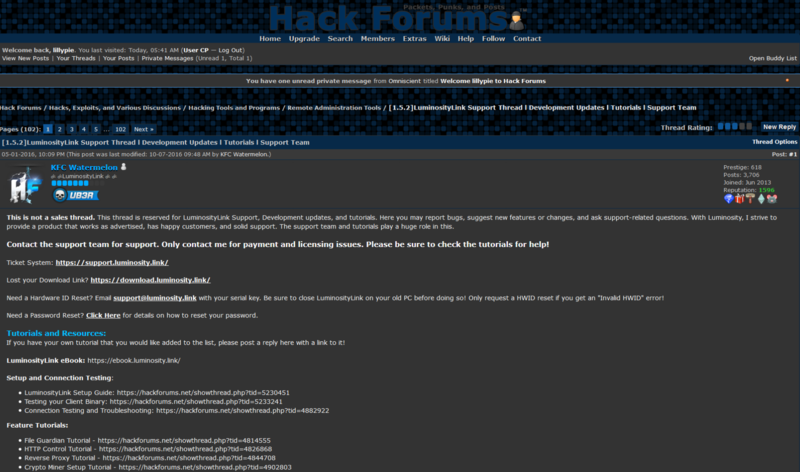 Hackforums users speculate that Grubbs’ arrest could lead to the arrest and prosecution of his customers. Image: Palo Alto Networks. Grubbs initially pleaded not guilty, and his trial was slated to begin in August. But in a plea agreement released today, Grubbs admitted to conspiring to make and sell LuminosityLink, and to knowingly assisting customers in using his software to break into computers. The plea agreement notes that on July 10, 2017, when Grubbs found out the FBI was about to raid his apartment, he hid the phone and debit card tied to his Bitcoin account, and also removed the hard drives from his computer and apartment prior to the search. “Three days later, Defendant transferred over 114 bitcoin from his LuminosityLink bitcoin address into six new bitcoin addresses,” the agreement states. The charges to which Grubbs has pleaded guilty carry punishments of up to 25 years in prison and as much as $750,000 in fines, although any sentence the judge hands down in this case may be significantly tempered by U.S. Sentencing Guidelines. A copy of the plea agreement is available here (PDF). This entry was posted on Monday, July 16th, 2018 at 3:09 pm	and is filed under Ne’er-Do-Well News. Open source code can be found everywhere but at what cost to safety?